For those of us that just can't wait. Nothing fancy but it keeps me going. No add ons but it works. 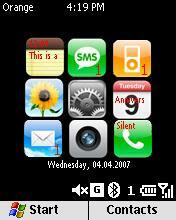 The notepad icon is for appointments, the SMS is for text messages, the ipod icon is for emails, the "Tuesday 9" icon is for all day events, the envelope icon is for MMS, and the phone icon is your profile. Scroll up/down till the words highlight and click. Sorry it isn't more. I'm working on actually making all icons fully functional.